NPX originated as the U.S. Navy radio call sign, assigned toward the beginning of Operation Deep Freeze...the Navy used/uses 3-letter call signs for shore stations, presumably to make things easier back in the Morse Code days. McMurdo is NGD, Palmer is NHG...Byrd was NBY...oh, and Diego Garcia is NKW...since I spent a bunch of time there I remember that one as well. The old Navy operations orders (OPORDs) for Diego Garcia, Deep Freeze, or wherever, included a communications appendix A in the back that listed all of the codes (I've seen a few of these for Operation Deep Freeze but don't have any copies that include Appendix A). 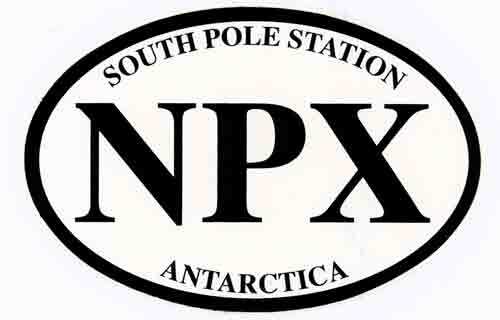 The designation NPX also appears on some of the old weather forms in the met office. John Gallagher scanned a collection of them during the 2005 winter and shared the files with me as well as the University of Wisconsin. As a more recent bit of official documentation, NSF has still been referencing it, in the official Antarctic Treaty information exchange there has been a communications "Attachment A" which lists the radio call signs (at the top of the pages), equipment used and frequencies monitored by the 3 stations. If you go to the NSF Antarctic Treaty Information Exchange page, the "2007-2008 Plans" page is the most recent one that includes an "Attachment A, Station Communications Forms." Yes, NSF is a bit behind in posting this stuff :) There used to be automated radio beacons at airfields that would continuously transmit the call signs in Morse Code for aircraft to home in on. Nowadays there are 4-letter airfield codes for the various airfields, kept by the International Civil Aviation Organization (ICAO) (a United Nations organization based in Montreal). Antarctica (or at least the NZ territory) falls under the New Zealand scheme where the first 2 letters are NZ, so McMurdo's airfield codes are NZCM for Williams Field and NZFX for Phoenix Airfield (the now-closed Pegasus Airfield was NZPG). Pole is NZSP. Wilkins Runway, the Australian blue ice runway near Casey, has an ICAO code of YWKS (Australia codes start with the letter Y) and Novo apparently has the code AQ-0001. The list of 3-letter airport designations used on airline schedules and baggage tags (LAX, CHC etc.) is maintained by the International Air Transport Association (IATA), an industry trade group also based in Montreal. 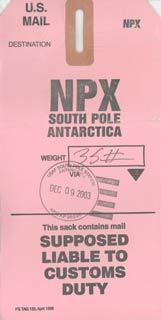 The only Antarctic airfield with one of these codes is TNM at Marsh Base (Chile) on King George Island.